Assmann linear polyethylene tanks are certified to NSF/ANSI Standard 61: Drinking Water System Components – Health Effects. 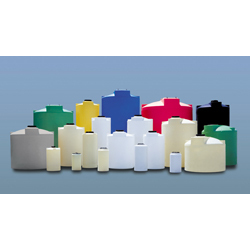 High-density crosslink resin tanks also have NSF 61 certification, are certified for chemical storage and are suitable for a variety of chemicals. The company offers a line of corrosion- and chemical-resistant tanks and containers in capacities ranging from 40 to 12,000 gal.